Ready to Inspire Actions that Matter? Crosby, one of the country’s leading independent communications agencies, seeks a Content Strategist to support our growing content marketing team. You will play a key role in creating impactful programs through the development of multi-format digital and social media content. This position requires a combination of a marketing and publishing mindset, with a focus on experience planning and user-first thinking. Must have a deep understanding of the entire digital/social ecosystem and is accustomed to working in a fast-paced, creative environment. Our collaborative environment and core values are a fit for high achievers who have a passion for promoting great clients and causes. This position is based in Crosby’s Annapolis, MD headquarters. 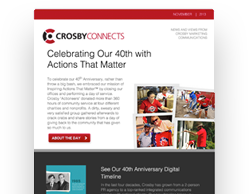 Crosby is one of the country’s leading integrated marketing agencies focused on Inspiring Actions That MatterTM. We’re driven to help our government, healthcare and nonprofit clients inspire actions that will have a positive impact on people’s lives. We offer generous benefits, bonus and profit sharing opportunities. Our headquarters are in Annapolis, Md. and we also have offices in Bethesda, just outside of Washington, D.C. This position is based at Crosby’s Annapolis office.